The prison industrial complex and the mass incarceration of people of colour in America are the children of chattel slavery, and the 13th amendment acted as midwife. This piece was originally published by Truthout.org on 7 February 2016 under the title 'Capitalism, slavery, racism and imprisonment of people of color cannot be separated' by Mark Karlin. 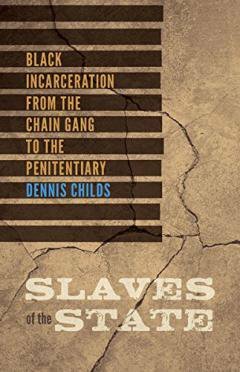 The following is an interview with Dennis Childs, author of Slaves of the State: Black Incarceration From the Chain Gang to the Penitentiary and associate professor of African American literature at the University of California San Diego. Mark Karlin: Can you summarize the tragic irony of the 13th Amendment's "exception clause"? Dennis Childs. Photo by James Ingram, all rights reserved.Dennis Childs: Yes, what I describe in the book along these lines is something that prisoners, activists and scholars from Angela Davis to Assata Shakur have spoken about for years – the fact that what is indisputably the most progressive document in US legal history, the 13th Amendment of the US Constitution that freed African slaves, actually reinstituted enslavement through racial, capitalist, misogynist imprisonment. The language of the amendment states, "neither slavery nor involuntary servitude, except as punishment for a crime whereof the party shall have been duly convicted, shall exist in the United States." This punitive exception represented legal cover for what, in Slaves of the State, I describe as an overall system of public-private neoslavery from the chain gang, to the prison plantation, peonage and the convict-lease system – the last of which represented an outright genocidal system where private corporations such as US Steel would work prisoners in industries ranging from turpentining, to coal and iron mining, to agricultural production. The death rates at convict-lease camps were absolutely staggering, reaching as high as 50% per annum. But, as I argue in the book, the exception clause ushered in a system of neoslavery that continues to submit prisoners to conditions that amount to a collectivized situation of 'living death', or what Mumia Abu-Jamal defines as "slow death" under the prison industrial complex (PIC). Let's start historically. How did the "exception clause" allow for the reinstitution of many Black people into slavery through incarceration in the years after the Civil War was over? Speaking historically, it is actually improper to speak of a single exception clause since the punitive exception goes at least as far back as the Northwest Ordinance in 1787 (and since prison slavery itself, going as far back as Roman antiquity). Specifically, the Northwest Ordinance contained a provision outlawing slavery in the territories of modern-day Ohio, Indiana, Illinois, Wisconsin and Minnesota, but also contained a provision allowing for the enslavement of a person upon "due conviction" by law. 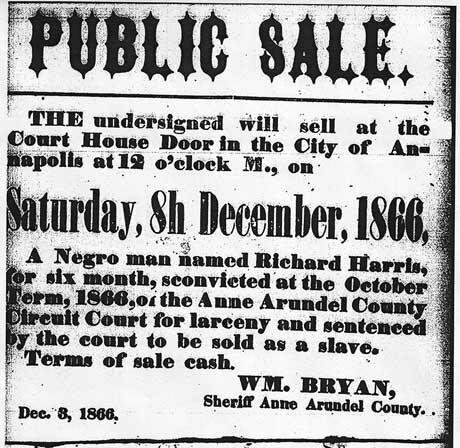 This punitive exception then extended right up to the eve of the Civil War through various "Black Codes" and "Black Laws" in Northern and border states from Maryland to Indiana to Ohio, all of which allowed for the public auctioning of Africans (both free and slave) for 'crimes' such as simply stepping foot in one of these "racially restrictionist" states, fleeing from a master or burning down a jail. These laws were then propelled into the postbellum period at a federal level in the "emancipation amendment", setting the table for rapid demographic transition of a Southern prison and jail system that had been predominately white (slaves were already imprisoned on plantations) into a predominately 'Black' institution. As Alex Lichtenstein points out in his important work, the postbellum move to prison slavery was absolutely fundamental to the process of industrializing the Southern economy after the Civil War. In fact, as I show in the book, Southern lawmakers were very aware of the fact that the exception clause allowed for a refabrication of enslavement under the guise of law and order. How is the "exception clause" manifested in the prison industrial complex of the contemporary United States, with the highest rate of incarceration in the world – which includes a disproportionate number of people of color? I'm glad you asked that question. I like to think of the work I do in Slaves of the State as a kind of 'history of the present'. And by that I mean, I wanted to follow the work of people like Angela Davis, who early in her anti-prison scholarship spoke of the fact that pre-1865 slavery was itself a form of incarceration. 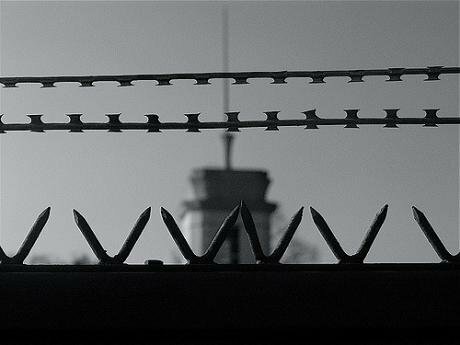 From that starting point, I wanted to offer a critical genealogy of today's system of legalized human warehousing, unfree labor and legal kidnapping – what is usually called 'the prison system' – by way of tracing its origin points in former systems like the chain gang, the convict-lease system and peonage. What I found is that when we speak of 'the' prison industrial complex that now encages well over 2.3 million people, we must also take into account earlier complexes of racial, capitalist, misogynist imprisonment that represent the conditions of possibility for today's PIC. In other words, the complex of private and public re-enslavement found on convict-lease camps, peon camps and prison plantations in the early 1900s was also a PIC, one that in its white supremacist structure was born of America's original 'prisons': the slave ships, slave pens and plantations within which Africans were imprisoned before 1865. In short, the book shows how the story of what commonly is called modern 'mass incarceration' has actually been centuries in the making. Would you expand upon how some crimes came to be punishable for the sole purpose of imprisoning an increased number of Black people? To clarify, when the Supreme Court of the State of Virginia ruled in Ruffin v. Commonwealth (1871) that the prisoner amounts to a "slave of the state" it was not solely referring to Black prisoners. Indeed the prisoner whose suit led to this horrifying ruling was actually a poor white person. We also need to remember that over 700,000 of today's prisoners are white. While it is vitally important that we recognize the anti-Black nature of today's PIC, we also need to pay attention to the fact that poor white, Indigenous, Latina and Latino, Asian, Muslim, migrant laborers and others are also caught in that dehumanizing structure. That said, we also definitely need to recognize that anti-Blackness and white supremacy have been at the core of this system since its outset, namely since Black people today represent approximately 12% of the country's population and over 40% of its prison population. Back to your question about specific crimes though, the most common early neoslavery 'crimes' were in fact hunger- and poverty-induced acts such as "hog stealing" and vagrancy, and other crimes such as public drunkenness, gambling or even giving an "insulting gesture" to a white person on a street. Black prisoners (and many poor white prisoners) were subsequently submitted to torturous regimes of unfree labor and punishment without any legal recourse, given that the very amendment that had offered de jure freedom contained a rhetorical trapdoor of re-enslavement. However, this does not tell the whole story. In the book, I speak of how prison slaves resisted these practices through outright rebellion, fugitive flight and acts of testifying to the crime of their re-enslavement through song, testimony and other forms of captive performance. I also look at novels by writers such as Toni Morrison and Chester Himes to see how this history has been reimagined in Black art. How is the state of incarceration related to the Middle Passage (that is to say, chained and entombed boat passage from Africa to US slave markets)? In part, what I define as the "Middle Passage Carceral Model" in the book suggests an interplay between racial and spatial terror. By this I mean that if you look at the diagrams of slave ships you see that they were literal prison architectures with what in modern prison architectural terms would be called a 'tiering' of human beings. So I compare the architectonics of spaces like the slave ship, barracoon and slave pen to those of a space such as the 'chain gang rolling cage', wherein Black people were vertically stacked upon one another and chained down with no room to even sit up straight whenever they were not at work building much of the Southern road, highway and railroad system. For me, the 'rolling cage' represented a kind of macabre rebirthing of the Middle Passage, a small-scale slave ship on dry land. Of course, words defy the horror that these spaces enacted on Black captives. But in the book I try to let the neoslave speak for herself through attending to aesthetic forms such as the chain gang song and other modes of neoslave testimony in order to not only exemplify the horror of neoslavery, but also the way in which Black people performed a reclamation of their humanness within spaces of dehumanization. The upshot that I'd like to point out here is that the book attempts to upset the well-worn narrative of progress in the US by looking at the connection between spaces like the 'slave pen' and today's seemingly countless neoslave 'pens'. 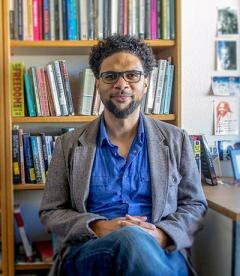 In our current moment of 'postracial' amnesia, the tendency is to look at the trans-Atlantic slave trade as a kind of dinosaur-age prehistory. The writings of Black prisoners such as Herman Wallace, Assata Shakur, George Jackson, Jalil Muntaqim and Mumia Abu-Jamal disallow this comforting image of slavery's prehistorical demise. I think this is captured vividly in the fact that Assata refers to herself as she sits in revolutionary exile in Cuba as a modern maroon – "a 21st century escaped slave". What is the similarity to the concept of ownership of the Black body between slavery and contemporary imprisonment? I use the rubric of what I call "human commodification" as a means of exploring this relationship. When we have phone companies, construction companies, banks, surveillance equipment manufacturers, private prison companies and scores of other industrial operations literally pilfering public funds to the tune of billions of dollars a year, it is not hyperbole to call this a structure of human commodification. I want to be clear here that this system of public investment to the end of 'private profit' is not simply about private prison companies like CCA [Corrections Corporation of America] and the GEO Group (though these companies are horrendous). The fact is that most prisoners are entombed within state prisons and county jails. While private companies do gain huge profits from these 'public' spaces, so-called public officials like prison guards, DAs, police, judges, legislators [and] governors are in fact 'public profiteers' in the PIC bonanza. In the book, I speak of how a full understanding of this modern system of profiting from collective atrocity cannot be gained without recognition of the foundational role of America's original system of human commodification: chattel slavery. This is not to say that the systems are exactly the same, but that something like a "chattel principle" has infused the Black experience of freedom since its inception. While it is important to attend to the specifics of the prison binge that has occurred since the Reagan era, with a 500% increase of prisoners in California alone since that time, it's also important to understand that this legal crime would not have been possible were it not for the foundational role played by slavery as America's original racialized system of incarceration. Why is Angola so significant in your discussion of the prison "slave plantation" model? One of the most clear-cut examples of what I describe as a centuries-old complex of human commodification in the book is Angola prison, the state penitentiary of Louisiana. This 'prison' is actually an 18,000-acre slave plantation that has never closed for business since the nineteenth century. It is a place in which Black prisoners (and other poor people) are made to pick cotton, corn and soybeans in the same fields in which their ancestors have been enslaved for centuries. However, I treat Angola and other Southern spaces of neoslavery as constitutive rather than exceptional to US empire. In other words, as we speak, I sit in California, a state that is literally the prison capital of the world, where many prisoners have been held in solitary confinement for decades, and where Black and Brown youth are targeted more as prospective prisoners than prospective university graduates. So I'm very adamant in the book that the prison system explodes any notion of a North-South binary. Indeed, if you look at the writings and activism of the 'Angola 3', for instance – that is Robert King Wilkerson, Albert Woodfox and the late Herman Wallace, three political prisoners who started a chapter of the [Black] Panthers inside Angola prison – you find that some of the most hellish regimes of imprisonment at the neo-plantation are actually 'Northern' style solitary confinement cells. But in terms of the specific aspects of modern Angola, the horrific treatment of its current prisoners as instruments of perverse amusement in spectacles such as the prison rodeo – and the fact that visitors to the plantation can purchase handcuff key chains, and prison-stripe shirts, and place their children in mock prison cells – speaks to a long history of turning the scene of enslavement into a resource of racist enjoyment in spaces like Angola. In this sense, my work extends Saidiya Hartman's discussion of how the enslaved body was used as an instrument of racist pleasure under the pre-1865 plantation system. Again, as we work to help liberate Albert Woodfox who has been in solitary confinement at Angola for over 40 years, I think it's important that we think of Angola as a microcosm of a national rather than sectional prison as plantation system, where the prison slave's 'labor' is represented as much in the profits made from his or her warehousing as from being made to pick cotton in a slave plantation field. Most Northerners like to see racism and slavery as a remnant of the South, but how does Northern policing and mass incarceration represent the insidious embedding of racism in the North? Great question. I use my chapter on Chester Himes' prison novel, Yesterday Will Make You Cry, to explore this issue in some depth. In it I write about how white supremacy has always been fundamental to a state like Ohio, one that is depicted in Himes' fictionalization of his own experience as a prisoner in the Ohio State Penitentiary in the 1930s. What I found is that at the time of Himes' imprisonment, Black people in the state were imprisoned at a higher rate in Ohio than Alabama. Indeed, on the eve of the Civil War, Black people, whether slave or free, were legally barred from even stepping foot into Ohio (or Indiana or Illinois) at the pain of being sold at auction as an indentured servant. This is why I argue that in addressing the centrality of racism to the capitalist project of imprisonment it is important to attend to the fact of rather than simply the form of racialized incarceration. As I stated earlier, I try to avoid the tendency of fetishizing a space like Angola, making it exceptional in opposition to a space like Attica in New York, where, as many of your readers may know, one of the most heinous acts of state terror was enacted in 1971, when Gov. Nelson Rockefeller ordered a massacre of 29 prisoners who led an uprising that asked simply that they be treated as "human beings." As we have this conversation, it is projected that one of every three Black boys born today in the US will spend time in a prison or jail cage, and currently one out of nine Black men between the ages of 20 and 34 are in a cage in a nation that is touted as the most 'free' and 'democratic' country on the planet. In California, we recently had over 150 Black and Latina women forcibly sterilized in a women's prison. What these atrocious facts represent is the reality of Malcolm X's statement about white supremacy as a national reality: "As long as you are south of the Canadian border, you are south." How is the US prison industrial complex intertwined with the history of capitalism in the United States? Like the military-industrial complex, the PIC represents a system of transferring public wealth over to powerful corporate and political interests that are wreaking harm on an unimaginable scale. But again, in the book, I try to point out the ways in which this modern system of profiting from human misery is grounded in ideologies of white supremacy that make the association of Blackness and criminality as interlocked in the modern white US imagination as "Africanness" and enslavement were before 1865. In this sense, what the important Black studies theorist Cedric Robinson calls "racial capitalism" is vitally important to my work insofar as it illustrates the degree to which racism is a part of the very structural mainframe of this society. That said, the one social predicament that brings together nearly every one of the over 2.3 million people encaged in the US no matter their race, ethnicity or religion is poverty – a lack of access to decent housing, fair employment, health care, education etc. I'm sure your readers may have heard that a recent Oxfam study found that the world's 62 most wealthy people now own more that the bottom 50% of the global population – which equates to roughly 3.6 billion people. This unspeakable fact of capitalism, its tendency to eviscerate whole collectives of people and then criminalize them for performing the predictable outcomes of that evisceration, is one of the instrumental pathologies that fuels the production of prisoners as commodities, namely poor people of color. It also informs the fact that since Bill Clinton passed NAFTA over 20 years ago there has been a 500% increase of immigration from countries to the south – and the fact that in following the uneven flow of capital northward, the migrant labor population is then criminalized as the most rapidly increasing demographic of prisoners in the US. This is why [President] Obama has been referred to as the "deporter in chief" by migrant activists, as he has overseen the imprisonment and deportation of over 2 million people. I hope that in offering a genealogy of what I call racial, capitalist, misogynist incarceration in the book I help move us further along in our critical approach to dismantling the PIC as both a national and global node in the larger neocolonial and imperialist project that is wreaking havoc the world over, especially in the global south. In conclusion, can you elaborate on your statement (in the book's introduction) "that racialized prison slavery has little to do with the alleged criminal acts of individual Black people and everything to do with the socially constructed crime of being born Black (or Indigenous or Brown or poor) in apartheid America"? Yes, as I stated earlier, there has long been something like a racialized self-fulfilling prophecy in the US whereby Black people (and other groups) are structurally injured by patterns of social disinvestment, unequal wealth and land distribution, [and] lack of adequate health care and access to education, and then blamed, jailed and/or killed for living the predictable outcomes of these structural disparities. In this sense, what in modern parlance is described as criminal recidivism, or repeat offense on the part of the individual Black person branded as 'criminal', is in fact a measure of a larger social recidivism, the wholesale repeat offenses of a racially classed and gendered society that allows certain entities to literally feed on the misery of the society's most vulnerable members. This is what led to someone I speak of in the book named Richard Harris being "sold as a slave" for the "crime" of taking a bushel of wheat over a year after slavery had supposedly been outlawed. The scene of a Black person's structural poverty being used as a mechanism of his criminalization and re-enslavement represents a symbol of Black life since 1865. Aquired by author from unpublished congressional digest. Public domain. That said, the book also attends to the incredible resistive spirit of those such as George Jackson, Assata Shakur, Leonard Peltier, Mutulu Shakur, Ruchell Magee, Mumia Abu-Jamal and many more anonymous prisoners in the face of this racist, classist and sexist system. In doing so, it also follows the words of Zaharibu Dorrough, J. Heshima Denham and Kambui Robinson, three members of the recent 30,000-prisoner hunger strike in California, who state that those of us on the 'free' side of prison walls need to take responsibility for the fact that our relative 'freedom' rests on the foundation of their unfreedom – that "to stand idly by now would be complicity. You must let the state know that substantive change at every level of society is something that the people demand."